For nearly a decade, A1 Medical Supplies has provided quality lift chairs,stair lifts, wheelchair lifts, and mobility aids for thousands of satisfied customers. Some of our customers include medical professionals, contractors, and government agencies. Big or small, A1 Medical Supplies is ready to provide you with the right accessibility solution today. Contact us today by calling 1-800-347-0153. Factory trained representatives are standing by to help you with your lift chair, stair lift, or wheelchair lift purchase. Stair lifts from AmeriGlide allow easy, safe access to your home's upper levels. A1 Medical offers the best stair lift warranties in the business and provides nationwide installation. Golden and Pride lift chairs allow you to recline and can lift you safely to a standing position. No matter what your build, we have a lift chair that is just right for you. Our vertical platform lifts can be installed for a variety of applications. We have experts on duty 7 days a week to help you or your contractor choose the perfect vertical lift for your home or business. We provide a complete selection of daily living aids to improve quality of life and safety in your home. Shop our complete selection of bath lifts, toilet lifts, and dumbwaiters. Browse our complete selection of home and vehicle wheelchair lifts. No matter the application, we have the wheelchair lift for you. From threshold ramps to modular ramps for your home or business, we have mobility ramps for nearly any vehicle or entry way. Why shop at A1 Medical Supplies? Price - We guarantee that our prices will not be beat by any retailer, any we have many special offers that other retailers do not have! We deliver all lift chairs, stair lifts, and wheelchair lifts factory direct to your home, eliminating the middle-man. We are so confident that our prices cannot be beat, we offer a 150% low price guarantee on every lift and mobility product on our site. Peace of Mind - A1 Medical Supplies wants you to be safe and happy with your lift chair or stair lift purchase. That is why we stand by every product on our site. We promise that you will not find a better warranty on any of our products anywhere on the Internet. If you ever have a problem with any of our stair lifts, lift chairs, or wheelchair lifts, we have technicians on call to give you immediate assistance. Expert Customer Service - Whether you have questions about stair lift installation, or if you need advice on how to file a Medicare claim for your new lift chair, we are here to help. With factory trained representatives on duty 7 days a week, A1 Medical Supplies is always just a phone call away. Call us now at 1-800-347-0153. Selection - At A1 Medical Supplies, you will find everything that you require to remove the barriers to your mobility and improve your quality of life. 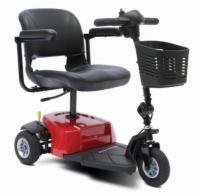 Need a mobility scooter or power wheelchair? We have the entire Pride and Golden Technologies catalog. Need to improve your bath room? Check out our selection of walk in tubs and bath lifts. Stair Lift Buy Back Program - If you no longer need your AmeriGlide or current stair lift, let us buy it back from you. Simply fill our our stair lift buy back form and we will contact you within 24 hours.